Over the past few years an emerging trend in wood flooring has involved hardwood flooring that exhibited written text or brand markings in the face of the flooring. 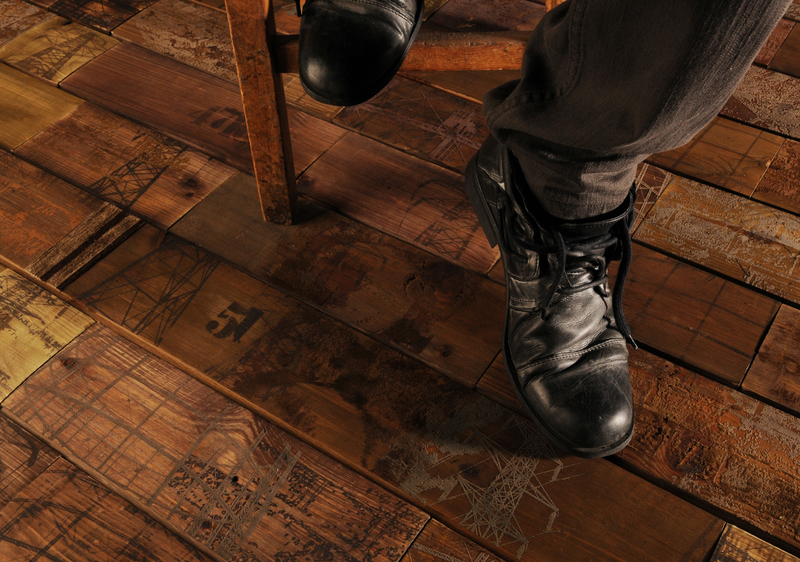 In this same vein a new technique in wood flooring has emerged that involves screen printing images and text onto raw wood flooring to give it both texture and contrast but also a worn and naturally aged appearance. This week’s feature article is an interview with a young flooring designer from the UK. Anthony Hughes graduated in July 2011 with a First Class Honors Degree in BA (Hons) in Surface Design for Fashion and Interiors from the University of Huddersfield, UK. Specializing in surface solutions for interior applications, Anthony uses screen printing, drawing and mixed media, embroidery and CAD to create designs for a variety of products. His design work includes glass, tiles and wall coverings and most recently, flooring concepts. His main inspirations range from decay and deterioration, to geometric forms and symmetry and he relates all of this to his passion for surface textures. WFT: Anthony how did you get started in wood flooring design? Anthony: I became interested in wood flooring design in my final year of University. I wanted to challenge myself after designing for glass and wall coverings and was looking for another surface to design for. WFT: What inspired you to create the Industrious Senescence line? Anthony: Industrious Senescence was inspired by industrial structures and deteriorating textures. Living in Huddersfield, UK at the time, I found various industrial spaces and structures like gasholders, electricity pylons and the canal and took from them the geometric forms and surface characteristics. Industrious Senescence evokes natural decadence and man-made power. WFT: Who is this wood flooring designed for? Is this a residential wood flooring product or commercial product or both? Anthony: The flooring concept was designed for both commercial and residential uses. The wood flooring comes in 4 different sizes (5″, 10″ 15″ and the longer length of 39.5”) so it can be laid in a variety of different patterns. The flooring can be used in boutique commercial outlets, restaurants or a residential space. WFT: Are you producing this in the UK currently? Is this product in production at this point or are you offering it as a boutique by-the-order line? Anthony: The flooring is currently not in production at this point, however a boutique order is something that I could offer a client. WFT: You show some interesting print technologies on the floor where you are overlaying images. Without giving away any secrets, how does that process work? Anthony: The imagery and surface embellishments are applied by screen printing. The wood is dyed and sanded before being printed on, re-sanded and printed again. 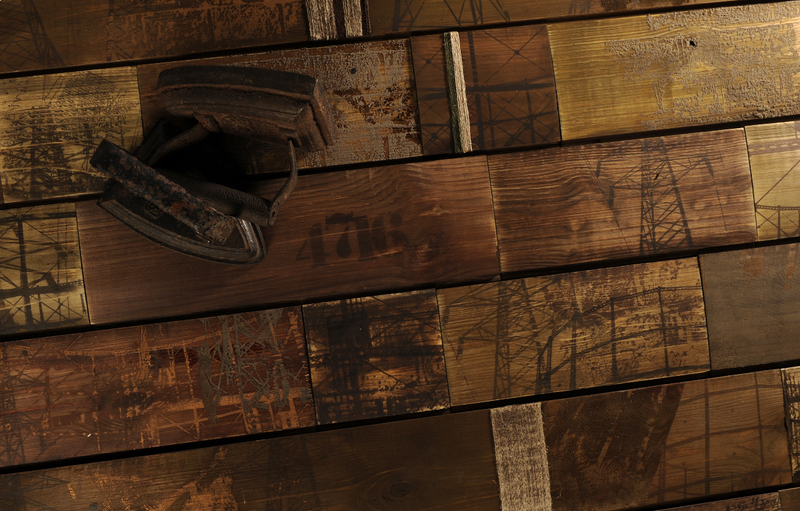 This way the product achieves that worn, aged look that also wears away over time. Industrious Senesence incorporates yarn and suede over-lays and screen printed images. WFT: You also mention layering different textures like suede. Can you tell us more about that process? Anthony: Suede is one of the textures applied to the flooring along with foil (which is sanded for an aged look) flock, twines and yarns. 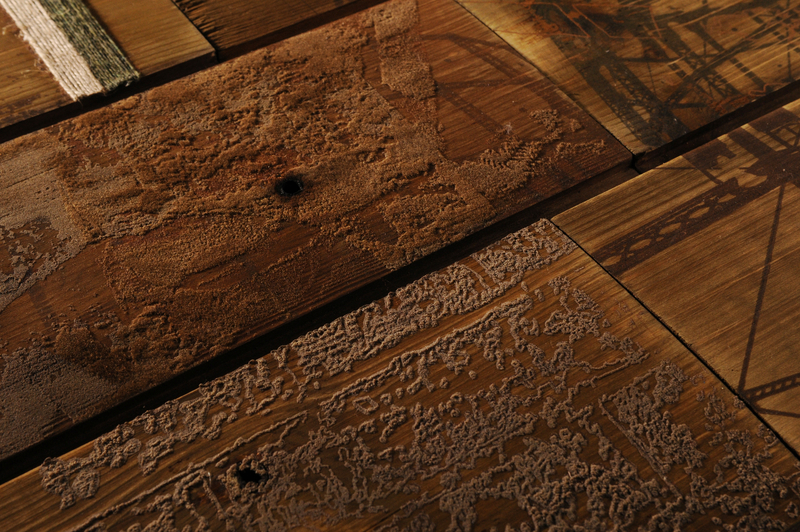 Combining all these textures together offers a sensory underfoot experience as each feels different to the next. These embellishments are all applied by screen printing bar the twines and yarns. WFT: From the pictures I can see yarn on-lays on the flooring. Tell us more about this feature. Anthony: The yarns are hand applied to the surface as a topical treatment. When the yarns and twines have finally worn off, they reveal more textures and print work beneath. WFT: I also notice the wood floor has visible over-wood that might normally be associated with lower quality mill work, however that is actually an aesthetic feature isn’t it? 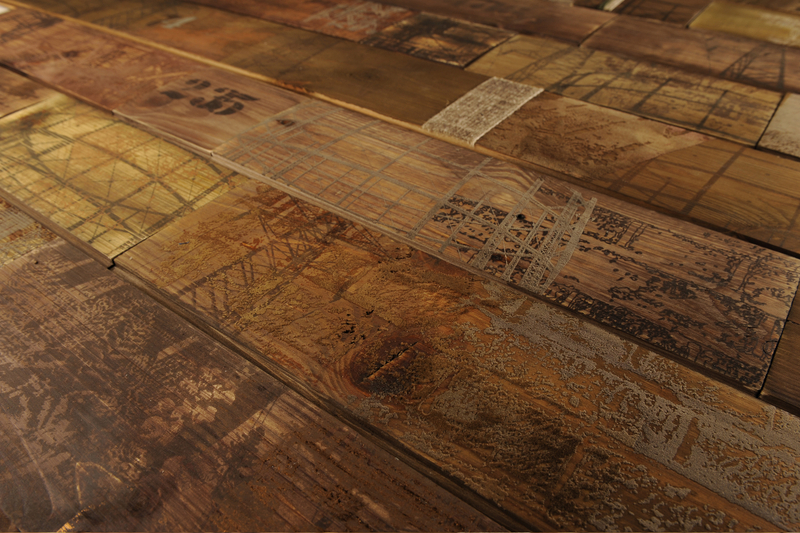 Anthony: I wanted the flooring to look aged, reclaimed and weathered. The over-wood came from the rigorous process the wood is put through. I wanted the product to look naturally aged and worn. WFT: How do you intend to go to market with Industrious Senescence? Anthony: I am happy to work with a client to produce a limited boutique run in the first stages of production. With relevant research into production techniques, I aim to look at collaborations with manufacturers to push the concept into production. WFT: What new projects in wood flooring are you working on now? Anthony: The key move at this stage is to go in to manufacturing with the Industrious Senescence product. After that, I’d like to work on different ways of using the surface embellishments with other surface finishes and imagery. Imagine a pure white gloss floor with a flocked floral pattern or a steel-grey stained wood with a different suede pattern. WFT: What is normally playing on your iPod when you’re working on wood flooring design? Anthony: All sorts really. When I’ve got lots going on or I’m up and about then it’s something more up-tempo. Otherwise when I’m getting down to designing, drawing and developing ideas it’s something more inspirational like the work of Clint Mansell or Howard Shore. WFT: Is there somewhere our readers could get a hands on look at Industrious Senesence? Anthony: Industrious Senesence will be on show at Surfaces in Las Vegas in January as part of the Trend Hub and the ‘Wonderwall’ run by Scarlet Opus. WFT: Thanks for your time Anthony, good luck with moving Industrious Senesence. Anthony: Thank you for the opportunity to talk about my work. I hope some readers will get a chance to view the product at Surfaces. I have seen ugly… but never have I seen so ugly. In the right space, I think this is really interesting and attractive. I’m not sure about the practicality of the yarns, but I like the rest of it.